A hot shower is a luxury you fail to appreciate until you do not have one. 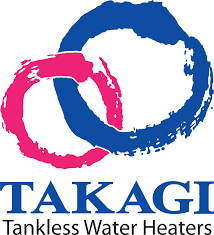 Takagi, originally a Japanese manufacturer, was the first to introduce tankless water heaters in the US market. The Takagi -KJr2-IN-NG Indoor is a model in Takagi’s line that consumers have received with much enthusiasm worldwide. This model is among the smallest models in Takagi’s line, but can produce water for up to two bathrooms in warmer climates. With the small dimensions, the heater fits well in small areas, which is advantageous especially for small homes. Although some consumers have complaints regarding the model, I still say that T-KJr2-IN-NG is among the best indoor natural gas tankless water heater. 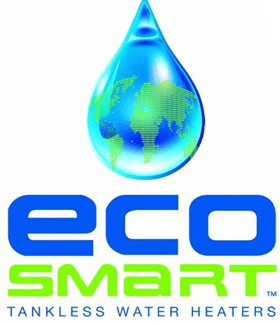 The unit is capable of performing functions that a 40-gallon tank type water heater can perform. Although Takagi T-KJr2-IN-NG Indoor is the smallest in all of Takagi line of tankless heaters, it scores the best in the technology front, and it has the capability to provide a regular supply of hot water for a family. The unit guarantees consistent water temperature through thermistors and features an air-fuel ratio (AFR) sensor that checks efficiency thus reducing harmful emissions. It has water temperature safety controls, and turns itself off if the machine overheats. Additional safety features include troubleshooting diagnostic codes, freeze protection, and surge protection. 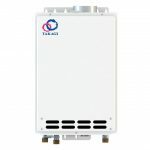 The Takagi T-KJr2-IN-NG tankless water heater does not need electricity since it performs on natural gas with an input between 19500-140,000 BTU/h. The flow rate of the unit is 6.6 gallons of water per minute (GPM) at 350F and the temperature can rise to 70oF at 3.3 GPM. The unit is also capable of supporting hydronic baseboard or radiant floor heating applications. This model is gas fed and requires venting to the outdoors, and venting can be horizontally or vertically. It has approximately 0.5 GPM activation rate and requires an 110-volt electricity supply. Although installing the unit is easy, it is important to have the unit professionally installed since faulty installation of the unit may result in safety concerns. It is important to be aware that warranty is only valid if a certified professional install the unit; hence, it is a better option to seek professional help. It is long lasting and has the capability to provide a family with hot water for up to ten years, and you do not have to heat continually water that you will not use. The unit has DIP switches making it easy to adjust its performance for altitude with settings for 4000-6000ft, 2000-4000ft, and 0-2000ft. The cost of Installation is high making the total cost of the unit high, plus some direct vent parts are not easy to find. You have to hire a certified professional to install the unit in order validate the warranty, which increases the expenses. Takagi T-KJr2-IN-NG can only supply limited hot water that is only enough for houses with two bathrooms making it unsuitable for bigger houses. Customers have given positive product reviews on various sites, but some customers have expressed dissatisfaction as well. From the ratings and reviews, Takagi T-KJr2-IN-NG seems to be the best heater for small sized families. According to reviews, consumers are in love with this natural gas tankless model's small size since it does not occupy much space, it frees up space in the house and guarantees hot water in the bathroom. Customers are not happy that one has to hire a professional technician to install the unit for the warrant to be valid. Hiring a certified professional to install the unit usually costs the customer as much as the price of the heater. If you are still struggling with a leaking tank water heater, you need to invest in a Takagi T-KJr2-IN-NG natural gas tankless water heater. The initial installation cost of the unit is high, but maintenance cost is low, and it is an environmentally friendly device. It weighs approximately 38 pounds and is small; measuring about 6.7 *13.8*20.3 inches, hence does not take up a lot of space in the house. The unit is available in various stores, and you can easily purchase one online from Amazon.com. Give your home a touch of class with Takagi T-KJr2-IN-NG, which is among best indoor natural gas tankless water heater.